This incredible tasting keto Almond Flour Porridge takes 7 minutes to prepare and is 6 net carbs per serving. It’s perfect for any Paleo or low carb diet. There are days I look upon my children’s Sunday oatmeal with jealousy. Don’t get me wrong… I love my usual breakfast of crustless spinach quiche, the occasional breakfast muffin or even a piece of crustless cheesecake. They keep me full for hours and I am happy as a clam eating the same thing for breakfast every day. I’m a creature of habit. Before choosing a low carb, ketogenic lifestyle, I looked forward to my weekends. Weekends were made for a warm bowl of comforting hot cereal or porridge. Oatmeal was my favorite; fixed with butter, brown sugar and a little milk, it was perfect. It didn’t keep me as full as my typical low carb breakfast, but it was a delicious treat! I’ve been happily enjoying hot cereal again – THIS is the best low carb cereal made with defatted-almond-flour from Sukrin. When I first examined the Sukrin Almond Flour, I didn’t know what to make of it. It’s dry, powdery, and not at all like the blanched ground almonds I am familiar baking with. It requires more liquid and time to absorb other ingredients. 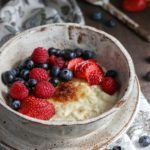 I admit that I haven’t used it much in baking, but it is perfect in this low carb paleo porridge! The recipe took me at least 10 times to get right. On it’s own, the defatted-almond-flour wasn’t quite the consistency I wanted. I alternately added blanched almond flour, sesame flour, oat fiber, and protein powder in search of the correct texture. The first several bowls were chalky and dry, lacking that smooth moist mouth feel I remembered. Using psyllium husk powder and glucomannan powder produced a cereal with the consistency of snot. The magic ingredients? Flax and an egg. Golden flax meal provides the cohesion I wanted and a beaten egg lends thickness and creaminess of texture. I would characterize the texture of this ketogenic hot cereal as between cream of wheat and thick oatmeal without the lumps. I added a little brown sugar substitute (Sukrin Gold), butter and cream to finish it off. Ahhh, low carb luxury! I was able to get 18 servings from one bag of Sukrin Defatted-Almond-Flour, about 75 cents worth of product per serving. Make your own low carb brown sugar = 1 cup granulated sweetener plus 1 tablespoon blackstrap molasses for 1 net carb per tablespoon (Sukrin Gold has zero carbs per tablespoon. I LOVE it!). Paleo or Dairy-free subs: sweeten with honey or maple syrup and replace butter with ghee or coconut oil; also sub almond milk or coconut milk for the heavy cream. Garnish with your favorite toppings but don’t forget to count the carbs. This low carb cereal is 2 net carbs per serving plain! With the berries it’s 6 net carbs and a great keto breakfast option. NOTE: An Australian friend said that she had success drying out the wet almond meal leftover from making almond milk and using it for the porridge. She dried it in a low oven and then re-ground it. I bet a dehydrator would work too! 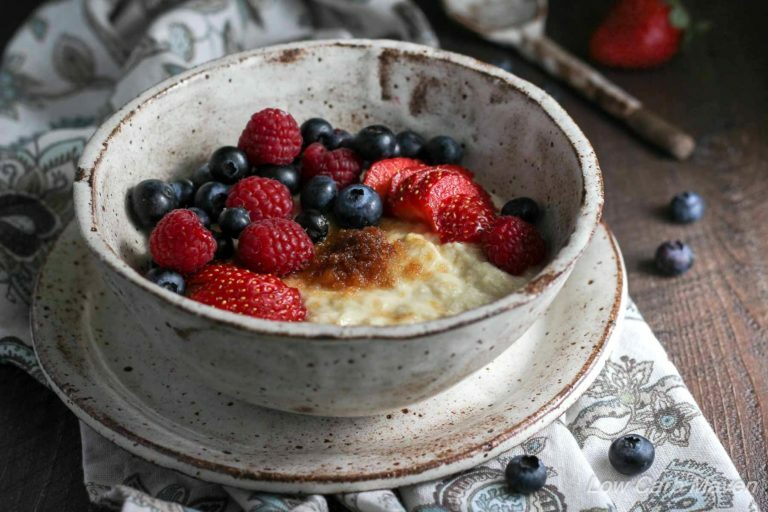 This incredible tasting keto Almond Flour Porridge takes 7 minutes to prepare and is 6 net carbs per serving. It's perfect for any Paleo or low carb diet. Traditional Method: Measure the first 4 ingredients into a small pot and place over medium high heat. When the mixture begins to simmer, turn the heat down to medium and whisk until it thickens and becomes hot. Remove from the heat and add the beaten egg, little by little, whisking all the while. Place back over medium heat and whisk quickly until the porridge gets thick. Remove from the heat and whisk for 30 seconds more. Whisk in the butter (ghee), sweetener of your choice and cream (or coconut milk). 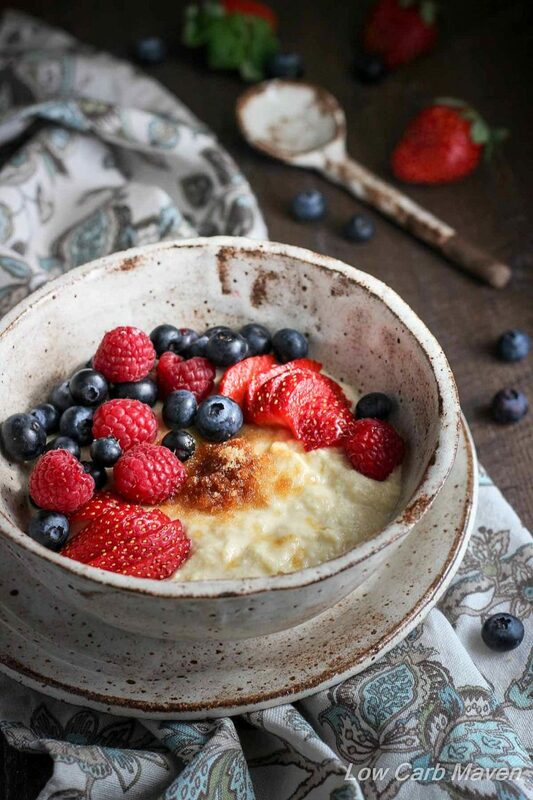 Garnish this low carb almond porridge with your favorite ingredients and enjoy! Microwave Instructions: Mix all of the ingredients together in a microwaveable bowl until thoroughly combined. Cook on hi power in 30 second bursts, stirring in between, until thick and hot. Only Sukrin's Defatted-Almond-Flour will work in this particular recipe. Just made this and so happy to have a low carb replacement for my morning porridge thank you! I used blanched Almond flour from Walmart and was delicious! I wonder if this can also be used as grits as well with savory additions? Going to try it your way first! Thanks for all your great recipes. I missed both cream of wheat and oatmeal. This was everything! I added cinnamon and walnuts to mine. Thank you so much! I Loved this recipe! Hit the spot! I used to love porridge for breakfast back in the day when I thought I was eating “healthy”. This was delish! Thank you so much for this recipe that I tried today. I bought all as you specified, and the only thing I left out was the cream as I didn’t have any. I didn’t miss it! It did taste so much like cream of wheat, which I always loved as a kid. For me, next time I will not mix in the Sukrin Gold, as it wasn’t sweet enough for me, and I topped it with more of same. I will not mix in and only sprinkle on top, so I use less and get that sweet flavor in every bite. BTW, that Sukrin Gold was amazing- looked, smelled and tasted like brown sugar. Can’t tell you how much I appreciate this recipe as I do love hot ‘cereal” and get tired of eggs. This cereal is the very best of all I’ve tried. I always loved cream of wheat and this is the texture and close flavor. The Sukrin Gold is the finishing touch. Thank you for working so hard on this for all of us to enjoy. How do I know if my almond flour is de-fatted? I use bobs red mill superfine blanched almond flour. Is that the same thing? I really enjoyed this as I an another who has been missing my hot morning cereal. I cooked it with regular almond flour, because that’s all I have, and I still liked it. I cooked it in the microwave in 30 second increments as you suggested. It was very good! Thank you! Absolutely amazing, thank you so much! Why will only Sukrins Defatted flour work. Won’t regular finely ground blanched almond flour work? Could I make this chocolate, like a coco wheats or chocolate cream of wheat, adding cacoa powder? I loved the recipe!! Even though I used what was on hand, I liked it enough to buy the actual ingredients recommended and try again. I used Bob’s Mill almond flour and ground flax seed meal but the result was awesome… put in some tumeric, ginger, shredded coconut and cinnamon and that’s all she wrote! Thank you for bringing hot cereal back to my low carb life!!! Can’t wait to try the other versions!! Maybe I’m a 20yo stuck in the body of a 60yo but I love porridge and cream of wheat (and I don’t know anyone my age who does). So I was super excited to find this. I made it and it has the perfect texture! I would even say it’s a 1 minute recipe and doesn’t require this many steps. I made it a second time, by putting everything in (including the beaten egg) and it thickened immediately. I used 10% cream instead of water and omitted the extra cream. It thickened to perfect consistency super fast. I also added 1/8-1/4 of vanilla extract to slightly mask the almond and flax flavor. This is super easy and fast, and you’re awesome for coming up with this! Hi, can you taste the egg in this? Thanks. When I first came across this recipe I was so enthusiastic to make it I used the Bob’s Red Mill superfine almond flour and the Bob’s Red Mill ground brown flax, because I was dying for hot cereal and that was all I had on hand. It produced a good porridge, very close to oatmeal in flavor (I added coconut flakes to give it a more oatmeal like texture as well). I finally got my defatted almond flour and ground golden flax in the mail today, and those ingredients yielded a very different final product indeed. Much more cream of wheat like, a finer grain and a much milder flavor. I really enjoy both, but I think even a non-low-carber would enjoy the recipe as written. The addition of egg is genius, I’ve been using flax as a low-carb hot cereal for a while and I’ve just been drowning it in warm almond milk and cream to disguise that slimy texture. Thank you for your kind warnings… you shed light on the same issue I had and like you, I had awesome tasting results!! Can I use almond milk instead? Also, can I omit the egg? Can this be reheated? Since I am planning yo make it the previous Day and reheated on the morning. THIS IS AMAZING! It’s my morning go-to. Thank you! I have groin flax but not golden flax meal. Can I use flax meal that is not golden? This is an awesome recipe for hot cereal!! I was missing it while on the a round of the Whole30. I substituted a medjool date into the recipe instead of a sweetener. I put it in while cooking the first 4 ingredients. I also used cashew milk (unsweetened) which I find to be thicker and more flavorful than almond milk. I will be eating this cereal often. Thank you for creating this recipe!! This was so amazing. I’m so grateful to you for working this recipe out for all of us. I shared with my sister and plan to make again and again! Can you post a photo of the defatted almond flour please so I know what to look for? I have used organic regular not Defatted….a along ….OMG….it was delish. The carb seems fine. But now iam worried. I still have a huge bag. Help! I have reviewed your recipe and did again my net carbs and I’m ok with my regular organic almond flour, it does wok and it has been so delicious. I do not add any fruits, never did actually. So I break at 290 calories. This hot cereal is fabulous. I use a bit less water and it is delicious. I have it around 6am with a big espresso and I am in heaven. Not hungry until noon. Really. This is remarkably similar to real cream of wheat! Wonderful! Thank you for discovering this recipe. I made this today and I love it. This goes on my list of breakfasts . Have you tried making a large batch and reheating with maybe a little cream? It would be nice to have some ready, in the fridge, on a busy morning. Thanks for the recipe! I️ can’t wait to try it. I just used reg almond flour turned out GREAT! This is my new favorite Keto breakfast! It’s different and so wonderful for fall. The beaten egg really puts it over the top! Thank you for all your experimentation. So glad we can benefit. This was very good!! It was one of those days where I just wanted to eat because nothing seemed to satisfy me. This ended up being what satisfied me!! I will be making it again. I used Red Mill Super Fine Almond flour and it worked gteat!! Where can I get the defatted almond flou?. Amazon has fat-reduced only. but thought you might need some clarification, ghee is butter, thus not dairy free. unless it’s fake ghee, alike fake butter. Hi Ruzanna. I was Paleo for a year and the whole family was dairy free because I have a child on the spectrum. I did a lot of reading about ghee. While clarified butter (or the drawn butter that is used in seafood restaurants) still contains milk solids, ghee is essentially just the milk fat. Almost all of the milk particles are gone – and of course it depends on how it is made. I skim all milk solids from the top and leave the browned solids in the pan. Then I filter through good quality coffee filters when I make ghee. Some big companies use large centrifuges to separate the milk fat from the milk solids. I loved this cereal! Thanks for the recipe! At first I thought it strange to add an egg, but it works and bulks up the cereal. I was surprisingly impressed with how this turned out especially as I didn’t read the recipe properly – I added coconut oil and some nut butter in the first step and used regular almond meal. Also I didn’t have flaxmeal so I roughly ground some flaxseed and chia seeds in a mortar and pestle which gave it a nice texture. Will definitely make this again and probably have the dry ingredients pre-mixed in the cupboard ready to cook. This is delicious! Had to use the organic almond flour I had on hand. I did it in the microwave withe the 1st 4 ingredients and the coconut milk, then added cinnamon and sweetner. I ordered the defeated almond flour and have been eating this all week, love it! Now that school is starting back up I’m not going to have time to make it in the mornings, wondering if making ahead and reheating has been tried? You mention about making it with coconut milk, are you talking about the kind that is in a can or the refrigerator kind that is in a carton? Thanks!! No worries at all! And the best part is–you get almond milk AND defatted meal, no wastage here!! Thanks so much for the recipe, it is absolutely devine…can’t wait for tomorrow morning’s breakfast to make it again!! Chia would be a better choice than flax and it will probably work in the recipe. Flax has an astronomical amount of estrogen and can have serious side effects. It has much more estrogen than soy, which is used as a treatment for menopause symptoms. I made this today. I used ground almonds and added 1 tbsp coconut flour and kept the rest the same. It worked really well I was pleasantly surprised! It had a good texture and tasted great. I have store bought coconut flout that I need to use. Would this work in place of the defatted almond flour? This looks like something I would enjoy eating and it doesn’t look very hard to make. May I ask how it taste? Could you use Chia Seeds (ground to help with thickening) in the event you can’t find the de=fatted Almond Meal? Looks delicious and the photos are amazing! I’m glad to see defatted almond flour is finally making its way to the U.S. In Europe, defatted nut and seed flours are very popular and much cheaper than ground whole nuts, since they’re a by-product of oil pressing. I use defatted almond flour a lot in breads and rolls, where I appreciate its finer texture and lower fat content (meaning the bread itself isn’t quite so filling). But you’re right, it is very different to work with. I’m always looking for other creative ways of using it, so thank you for this recipe! I will definitely be giving it a try. I only have Honeyville almond flour at the moment. Am going to try. Won’t work at all? 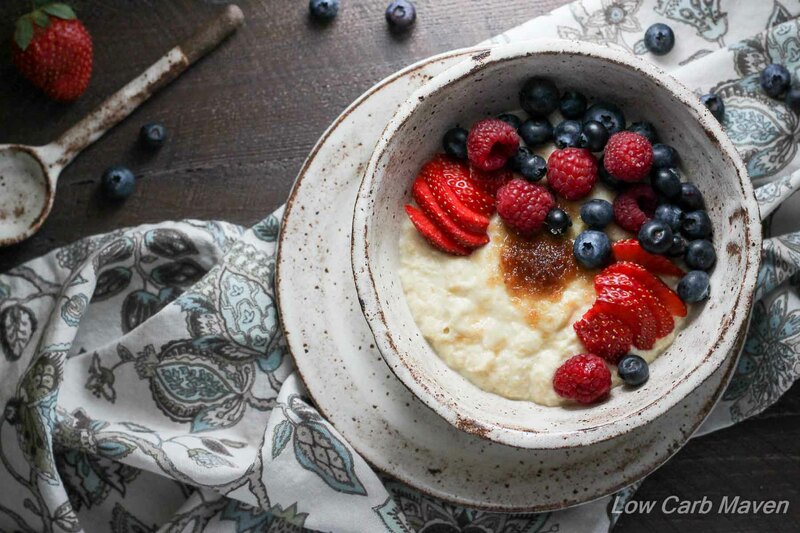 This looks wonderful, and I’m always happy to have more hot keto cereal recipes (my favorite is a mix of chia, golden flax meal and almond flour). Though from the difficulties you had getting the consistency right, and the comment above stating that it can’t be used in place of normal almond flour OR coconut flour…this defatted almond flour doesn’t seem like a very appealing purchase. :( Maybe when/if there are more recipes utilizing it? Hi Nic. I certainly understand your view and appreciate you giving your honest opinion. Thank you. This looks really good. I love a good hot cereal. I loved oatmeal and cream of wheat, in particular! Hmmm. I wonder if the defatted almond flour would act more like regular flour in baking? Please tell me what defatted almond flour is? I dont think it is sold in south africa. Can one make their own?